When is it permitted to drive in reverse? When it is required from a traffic-related point of view. When it is required for personal reasons, even if driving in reverse is not essential. Only when the roadway is wider than 4 meters. It is always permitted, as long as we are always seen by other drivers. Is it permitted to drive a heavy vehicle when the air pressure in the braking system is below the required minimum? Yes, but only under permission of a policeman or an officer. Yes, but only if the vehicle properly brakes. Yes, if definitely no leak is detected. You are always permitted to drive on the left lane only. You are obliged to drive in the right lane, unless you are overtaking or turning left. 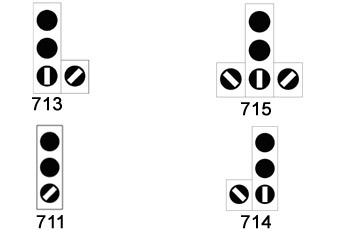 You are permitted to drive on the right or left lane, according to the type of the vehicle. 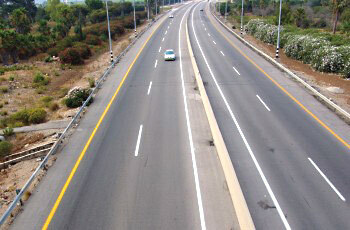 You may drive on either lane, as long as you don’t cause any risk to traffic. To whom should you hand lost-and-found objects found in public vehicles? Nobody. You should locate the owner and return the lost object to him. To the dispatcher at the taxi station of the same route service. To the police, or according to any pre-determined arrangements with the owner of the route service. To the dispatcher at the bus station of the same route service. The deeper are the grooves in the tires. The more worn-out are the tires. The higher is the tire air pressure. The heavier is the vehicle. What is a “vehicle non-use notice” (taking a vehicle off the road)? A vehicle non-use notice given to the driver by a policeman, a car assessor or a driving examiner due to a malfunction of the vehicle or damage caused by an accident. Which traffic sign that is placed before an intersection requires drivers to give right-of-way? Is it permitted to make changes in the vehicle’s design or type? The Owner of the vehicle is permitted to make changes in it as he pleases. Yes, but provided that the owner of the vehicle notifies about it in advance and in writing to the vehicle’s manufacturer or agency. Yes, but only if the change is made by a licensed garage. Yes, but only with a written pre-approval of the Licensing Authority. What is the responsibility of a vehicle owner as regards to an offence committed by his vehicle? Absolute responsibility, unless he can prove that another person drove the vehicle at that time. If he doesn’t drive the vehicle, he bears no responsibility. The vehicle owner is only held responsible if he is present in the vehicle while another person is driving it. The vehicle owner is responsible for it even if the vehicle is stolen. Narrow bridge. 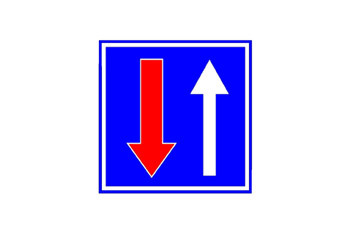 Give right-of-way to vehicles coming from the opposite direction. When is it permitted to pass more than one vehicle during one overtaking maneuver? 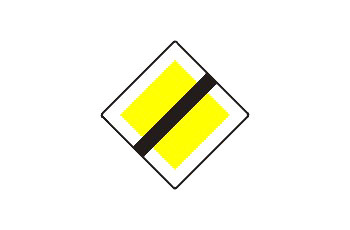 It is permitted in a straight and level roadway only, and prohibited in any other type of road. Never: You are lawfully obliged to overtake only one vehicle during an overtaking maneuver, and to return to the right lane. When overtaking is not restricted, and there is enough space in the overtaking lane for safe completion of the overtaking maneuver. 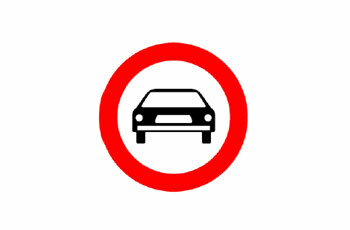 It is permitted when you overtake small vehicles only, and prohibited when you overtake big vehicles. 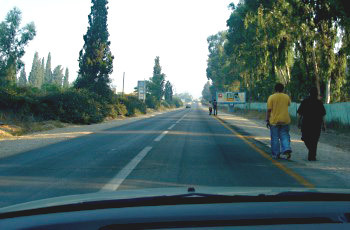 In the event of a bus driving outside the traffic transportation lane – Is it allowed to overtake another overtaking vehicle? It is permitted, provided that there are no passengers on the bus. It is prohibited on all types of roads. It is permitted in all types of roads. It is permitted, provided that the all up weight of the bus does not exceed 10,000kg. Which sign permits a vehicle driver or a Tram driver to proceed only to the right? You are driving vehicle no. 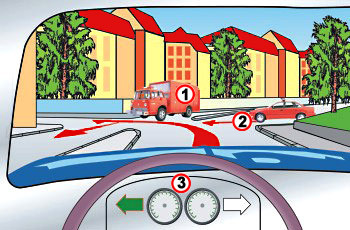 3 before an intersection without traffic signs. 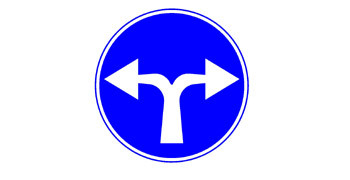 According to the rules of giving right-of-way, in what order should vehicles that arrived at the same time enter the intersection? You enter first (3), the garbage truck comes second (1), and the private vehicle is last (2). The garbage truck enters first (1), second is the private vehicle (2), and you go last (3). You enter first (3), second is the private vehicle (2), and the garbage truck is last (1). The private vehicle will go in first (2), you go second (3), and the garbage truck is last (1). Brief stopping is permitted but parking is prohibited. 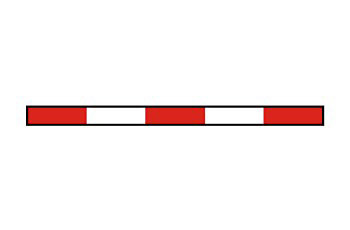 A barrier before a level crossing. Parking is allowed with parking tickets. No Stopping and parking, except for buses. Correct. Beer is regarded as an alcoholic drink, but it doesn’t influence driving at all. Incorrect. The influence of beer is similar to that of any other alcoholic drink. Correct. Beer is not regarded as an alcoholic drink. Correct, but the influence of beer is different than that of other alcoholic drinks. Taxi ride tariff from 21:00 until 05:29, excluding Sabbath and holidays. Tariff for both week days and holidays. 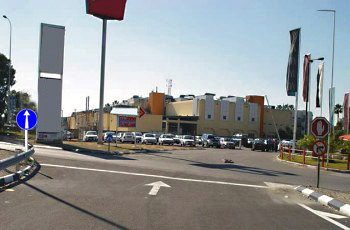 Tariff on Sabbath and mid-holiday periods, from 07:00hrs until 21:00hrs. Where should vehicles drive in a road divided by a Central divider? On the left of the Central Divider. How would you mark a vehicle that was forced to be left standing in the road? Place a blinking flashlight to be seen to a distance of 30 meters. Turn on the two front winkers. Turn on the headlights during “light time”. 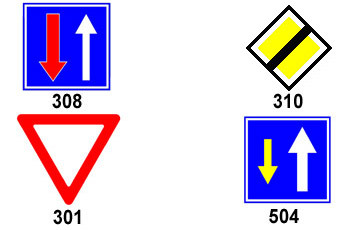 Place a warning triangle behind the vehicle that can be seen from at least 100mtrs. While searching for a parking spot. When the vehicle is standing.